Yves here. We’ve continued to post on immigration in Australia since it is an important case study. First, in Brexit discussion, UK officials have repeatedly stated their desire to move to a “skills-based” immigration system like Australia’s. The rules may have changed since I was there (2002-2004), but Australia used a points-based system which gave points for being young, educated, language proficiency. One of the complaints was that young people could get in who might not necessarily get jobs because they didn’t have local contacts and back then (when Australia was still pretty restrictive on the total number they allowed in per year, to the consternation of businesses; that changed shortly after I left), more people tended to be let in with techie skills than there were jobs. (Canadian readers might weigh in. Canada requires that you apply to a particular province, and from what I can tell, the provinces are very specific as to what kind of skilled migrants they want, like “fry cooks” and “hospital administrators”). Second, Australia is instructive in having gone from a period of relatively low immigration (the population was barely growing when I was there) to having population increase by 20% in about 13 years, due pretty much entirely to liberalized immigration. 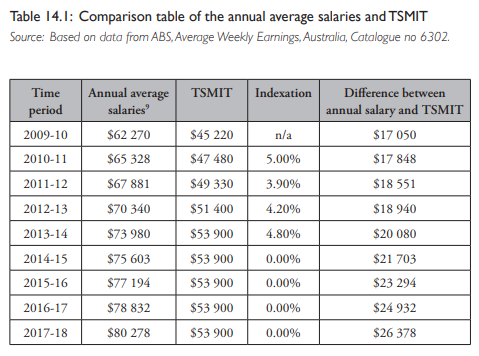 Yesterday, a group of labour academics released a book, entitled The Wages Crisis in Australia, which bemoans Australia’s anaemic wages growth and offers policy prescriptions. Locked away in chapters 13 and 14 are incendiary analyses on the great Australian migrant wage rort, which is unambiguously lowering employment standards and undercutting local workers. While the book has done an excellent job of dissecting the systemic rorting of temporary migrant workers, which is undermining broader wages growth, it unfortunately has not also addressed the rorting of Australia’s permanent ‘skilled’ migrant program. 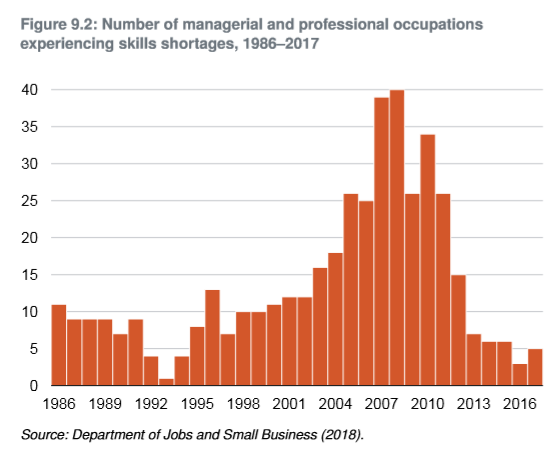 As noted previously, not one of the top five occupations granted permanent visas in the skilled stream in 2017-18 were in labour shortage over the past four years, according to the Department of Jobs and Small Business’ “historical list of skills shortages in Australia”. Remember, it is the permanent migrant intake that is primarily behind Australia’s population increase and therefore the choking of infrastructure and rising housing costs, in addition to dragging down wages. Many migrants also come to Australia initially on temporary visas with the hope of transitioning to one of the many permanent non-humanitarian visas handed out each year (numbering roughly 160,000 in 2017-18). Therefore, if Australia was to remove the carrot of permanent residency by slashing the intake, it would also automatically reduce the flow of temporary migrants, since the two areas are intrinsically linked. In turn, workers’ bargaining power would be increased. More broadly, ordinary workers’ cost of living would be reduced through lowering immigration, for example via cheaper housing (both prices and rents) and infrastructure, not to mention sinking the Australian dollar, thereby making trade exposed industries more competitive. Ultimately, Australia’s so-called skilled immigration system is one giant rort that’s all about lowering labour costs for employers by crushing wages and abrogating their responsibility for training, while also feeding the growth lobby more consumers. It needs root-and-branch reform, starting with dramatically lowering the overall permanent migrant intake, as well as setting a wage floor for ‘skilled’ migrants at the 80th to 90th percentile of earnings, thus ensuring the scheme is used sparingly by employers on only the highest skilled migrants, not as a general labour market tool for accessing cheap foreign labour. This entry was posted in Australia, Free markets and their discontents, Guest Post, Income disparity, Regulations and regulators, Social policy, The destruction of the middle class on November 30, 2018 by Yves Smith. I’m very much against skills-based immigration. Developed countries should stop skimming other countries human capital and invest in their own workforce. I’m very tired of businesses looking for government to solve business problems for them. It’s not the government’s job. Immigration (though it should be reduced) should prioritize keeping/reuniting families. Our societies need to focus on fixing and maintaining communities, not on handouts for businesses that want to employ low wage labor. Happy Friday, everyone! Apologies for the mini-rant. I’m very much against skills-based immigration. So you’re in favor of pushing down wages for lower-skilled workers? As one example, here in the US we have massively overpaid doctors who badly need to be exposed to foreign competition. I don’t want to skim off other countries’ investments in mes school, but what is the alternative? And what does it do for racial inequality when every year you bring in more low wage people who aren’t white? So you’re in favor of pushing down wages for lower-skilled workers? As one example, here in the US we have massively overpaid doctors who badly need to be exposed to foreign competition. I don’t want to skim off other countries’ investments in mes school, but what is the alternative? Negotiate standards for residency and cease impeding free movement of medical doctors’ labor. If they choose to leave their home countries, that’s their individual right. And not just countries and doctors but the states and all licensed occupations. A single national computerized licensing system where someone from Maine who wants to cut hair or teach children in New Mexico doesn’t have to physically fly there and pay for hotels the year before in order to take the licensing exams. This is state level protectionism and a giveaway to the continuing growth education industry. You have clearly never tried to establish residence abroad. There is no right to set up residence in any country in the world, let alone work there. Help me. You really need to think this through. While I am deeply grateful for this site and all the work you do on it, I am disappointed at the tone you take with commenters, including the ad hominem remarks such as suggesting I haven’t been resident abroad (as if that were relevant). I have established full legal residence in one foreign country, and temporary residence in two others, and while I am aware that there is not a right to residence or work, there is an internationally recognized right to leave one’s country, which stands counter to any “Brain Drain” concerns, which is what the original comment I was quoting was referring to. At any rate, any legal right can be created. Or, we could just create more visas. There are already attempts to harmonize state licensing requirements and also to allow licensees in one state to work in another, though unfortunately conservative free-market types are using it as cover for deregulation. Here is the Interstate Medical Licensure Compact which covers 30 states, but not the wealthier coastal states. There is something similar for nurses. I don’t think it’s hard to imagine this being expanded radically even if we decide not to fully federalize licensing. But for some reason this is not considered a liberal or left issue and the conservatives are taking it over. If you want not to be misinterpreted, you should take care as to which remarks you endorse enthusiastically. Supporting the idea of an individual to leave their home countries as an individual right and “free movement” of labor is inconsistent with having experience with immigration requirements. You provided the grounds for any reader to see you as ignorant of immigration procedures. Re medical licensure, hospitals are still regulated locally, and those requirements likely intersect with state medical licensing rules. I do not like the nexus of control on this being Federal or states ceding their authority. Federal pre-emption has worked very much against individuals in banking and financial services. New York State has very strong consumer protection in the medical arena, and I don’t like the idea of cross-state pacts weakening that. Yes Joe, doctors and lawyers, dentists, all skilled at preventing overseas competition and limiting numbers of students, particularly at the specialist ‘schools’. I’m reminded of Silicon Valley, where employment of legal immigrants has had a vast effect on employment for citizens, wages, and housing. For example the Santa Clara County vote count for Proposition Ten Rent Control would have been significantly higher if there weren’t such a large population of renters who were legal immigrants who could not vote on the issue, ditto the entire state of California, where there are also large amounts of illegal immigrants). Not mentioned in this piece is whether the predominance of legal immigrant employees were male. In Silicon Valley they were/are, and if certain zip codes are studied, the decrease in female populations is quite evident. In essence, this seems an importing of some of Asia’s gender imbalance of males over females. The big If there is, if the workers have the proper avenues by which to bargain with. Conditions nominally amenable to gains in worker’s bargaining can only carry through on that if the workers have the tools like strong labor laws and unions to action their leverage. That is why, despite the tightened labor market, US wages aren’t seeing any real growth. A truly tight labor market does manifest the standard action for getting better wages, that being finding a better job elsewhere (AKA “voting with your feet”). Employers of people leaving would respond by increasing wages to retain people. And the new employers would need to pay higher wages/benefits to attract the new employee. Stagnant wages are evidence of anything BUT a tight labor market. This “raise my pay or I’m going to a better job” phenomenon needs no strong labor law enforcement or strong unions. To me, the entire “tight labor market” story is yet more evidence of the alliance of government, media and businesses in their power over wages by keeping the supply of labor high. The government and media are telling the workers the job market is good, (“record low unemployment”) while being confident workers can’t really find a better job elsewhere. I know in my Northern California area, the fast food restaurants are having problems hiring/retaining low-wage workers. The reason is the wildfires of Oct 2017 created a lot of current demand for construction workers and many fast-food workers “voted with their feet” for better paying construction jobs. That is true evidence of a “tight labor market”. Much like the Nagle article, and all other pieces propounding this point of view, would punish immigrants for the sins of business. This is not to say that immigration doesn’t have a real impact on workers. The ability of business owners to take advantage of the vulnerability of immigrants to suppress wages is very real. What is absolutely flabbergasting to me is to then make the choice to go after the immigrants rather than the business owners. Completely ignored is the fact that increasingly restrictive immigration policies will then have a very real impact on the lives of immigrants. Lives that are already very difficult (as are the lives of working class people around the world). Persuing policy that would make the lives of immigrants much worse rather than strengthening labour protections for all workers is not a moral, nor a practical, position. It is a position taken for the sake of political expediency which further divides the working class. Each sovereign government has a duty first and foremost to its own citizens. Sovereign governments can only control the laws and policies of their own countries and not others, which is why it’s best to let each sovereign government worry first and foremost about its own affairs and not try and solve the problems of the entire world. The United States can no more solve world poverty by giving every poor person in the world a low-wage, unregulated, non-union job than I can solve the problem of poverty in my community by leaving my front door open and encouraging the pillage of my home by those of lesser means. The concept of duty is both a common sense moral concept and a very old and well-defined legal concept. If I were to be charitable to strangers to the point of not being able to feed, clothe or house my own children I would not be considered a noble and great human, I would be considered a fool that had failed to satisfy my most basic and important duty to the people I was most responsible to. I would be failing those whom I owed the most as well as those who depended on me the most. Did you read the post? Is there something you believe the authors got wrong? Emotional moralizing about the helping italicized “all workers” while perhaps well intentioned, ignores the incredibly basic and irrefutable concept of duty. You are also ignoring scholarship, the suffering of the US poor (Case-Deaton, decreasing life expectancies) and the absolute caustic effect flooding the borders with cheap migrant labor has on social cohesion and democracy. Brexit, the Yellow Vests, Trump, you want more unrest and anti-global right-wing populism that tilts towards fascism? Continuing to add low-wage, undocumented, black market, excess labor at time of stagnant wages, high rents, and low government services is recipe for disaster. Convince me otherwise or spare me the teary eyed pleas for throwing open our borders to the global poor. There’s certainly no need to be nasty, and rich nations should be charitable, but let’s not indulge the delusion that we can employ the entire world while still maintaining some kind of decent standard of living in the US. We are in agreement regarding enforcement however. Go after the employers of illegal labor and end this neoliberal sanctuary city madness. A cohesive policy of staunching demand and reducing enticements will be far more effective than the most expensive border wall. Jerry, I basically agree with all your points. However, I would emphasis that, where possible, one nation should seek to help another. The flip side of reducing immigration is a reaching out to countries where the pressure to immigrate is high. Of course the first, most important, step is to stop interfering in countries in ways liable to promote people movements. Wars in Iraq, Afghanistan & Syria spring to mind. The installation & support of authoritarian (criminal) governments is also less than useful: Hondurous is a topical example. Fair trade, & foreign, targeted aid aimed at social fundamentals such as agricultural self sufficiency, universal education & infrastructure are positive steps. Agreed, that all sounds wise and good. Not opposed to any of that nor am I opposed to legal immigration. The United States takes in about 1.2 legal immigrants every year and I am mostly OK with that, although I would offer a few tweaks to the formula if anyone cared what I thought. My beef is chiefly with illegal immigration, bosses that use immigrant labor as a bludgeon against the native born work force, and the mostly well-meaning but completely naive open-borders people who pretend we can fix the world just by bringing all the world’s poor Stateside. Sure, go ahead and bring the poor, the dispossessed, the down-trodden, but we have to make sure we are taking care of our own poor and down trodden first. (we are not) Immigration can be a wonderful thing, but only if the influx can be employed in a non-exploitive manner and assimilated without overtaxing the system or straining the broader social fabric. Unfortunately that has not been the case in recent years, hence my opposition to those arguing we should open the tap even wider. I care about the global poor, but my first allegiance is to my country and my fellow countrymen who are impoverished and suffering. Oddly, I’m not seeing the open borders crowd advocating arrest and imprisonment for employers who hire illegal immigrants (or commit wage theft, either). It’s almost like they’re doing capital’s work for them, and not just on labor arbitrage. The term “open-borders crowd” is being thrown around a lot in this discussion. Could we please have a definition or description of who that crowd is, precisely? They emerged very suddenly and with great force on Twitter and in Dem circles shortly after Trump was elected. “Abolish ICE” (which could mean reform of immigration processes but also for some stood for open borders) quickly morphed into “open borders”. Lambert and I sense this is not organic but we can’t prove it yet. I fear I may be the one who started the trend of misusing “organic” this way. I knew at the time that the correct term was “autochthonous” but some malign inner copy editor railed at me for even considering using such a such a highfalutin’ word, so I fudged it. There’s a very loose, ideologically broad and squishy ‘open borders crowd’ which seem to be motivated by anti-Trump, knee-jerk reactions, emotional video footage, and social media band wagon chasing. There’s also a very serious, politically engaged, activist Open Borders core which may be best represented by the Chicago based, 501-3c, tax exempt ‘Pueblo Sin Fronteras’ (Directly translated as ‘People without borders’) Pueblo Sin Fronteras unsurprisingly has called for the abolition of all state borders and endorses illegal immigration in the pursuit of its goals. This group has been involved in organizing and aiding the high-profile, large migrant caravans from Central America to the US – Mexico border in recent years. The whole migrant caravan spectacle seems like a false flag PR operation dreamed up by Steve Bannon. Conspiracy theories about the caravan and Pueblo Sin Fronteras do abound, but most seem to be propagated by right wingers blaming typical “liberal” boogeymen like George Soros. I too shared your skepticism initially, and I still wonder about the ulterior motivations and the funding behind some of these groups, but as daft as it sounds, ‘Open Borders’ is a real rallying cry for some US citizens now, even the native born. I certainly can’t speak for Naked Capitalism, nor can I claim to be a good barometer of the commentariat’s sentiment, but I thought the essay was absolutely terrible. Terrible in the sense that it was packed full of lingering unaddressed contradictions plus a hefty amount of half-truths and omissions. I have my biases of course, but I found Angela Nagle far more logical and convincing. Resorting to touting the history of “libertarian socialism” as proof of a intellectual history of an open-borders Left seemed like a comically bad defense. Has anyone ever met a libertarian socialist? That seems about as sensible as a carnivorous vegan. The authors simultaneously claim immigrant labor drags down wages for natives, maybe lowers wages for natives and doesn’t affect wages, all in the same essay. They then go on to say, like they do about almost all all of the closed-border left’s arguments, it doesn’t really matter, what’s true or what’s material, the really important thing is that we be nice to foreign poor people as a principle and support the concept of unfettered freedom of movement. Any enforcement action or deterrence aimed at reducing the employment of illegal migrants, such as E-Verify, is an unspeakable cruelty. No where is there any concern or mention for the suffering endured by the native citizen who has lost his job to the lower-priced, undocumented, migrant. If the native losers on receiving end of mass immigration are mentioned at all it is only to wave away all of their grievances as racist or to dismiss them completely with some sort of empty, moral sloganeering about freedom, which to me is a shibboleth for the Koch Brothers libertarian crowd. “Choice” and “Freedom” are poll tested buzz words to get Americans onboard with polices that are really bad for Americans. Total garbage. That would be the sort of socialism where the state is too weak to convey services (e.g., #MedicareForAll). No thanks. So Grover Norquist and his dream of a government “weak enough to be drowned in a shallow bath” would be Libertarian Socialism? Yikes! Libertarian Socialism = Social Darwinism apparently. How “Left”. ‘Libertarian socialism’ was the original name for what is now known as anarchism. Ironically, this country was able to do more good with a population of 142 million than it can today with 338 million. More people to service is a communities fiscal nightmare. We are living through it right now where I live. But population growth is good, right? Too bad that there are places like Florida, where so much of the state is funded by taxes collected on (residential) real estate (billions, maybe, in RE tax revenues“foregone” as a subsidy to “job-creatingdestroying businesses.” All to feed the insatiable eternal “Florida land boom” that empowers developers and Big Land Owners in their oligarchic bribe-buying of the state government structures and systems. Sales taxes are right up there, too, with upward pressures from all the nominal do-gooders that sell great “reforms if only we just had another penny more on the _____ tax rate.” We also have a so far still milkable cash cow in the form of “bed taxes” paid by people from Elsewhere who come down here for a dose of Florida sunshine and warmth and “culture.” There will be an endpoint to that, just down the line. All about that neoliberal-conservative-libertarian must-have, “groaf.” And of course we mopes here suffer from (and too many of us might even minutely benefit from, and thus foolishly favor) vast corruption. It will be interesting to see what kinds of “opportunities” our predator Governator, Sick Rott, finds or creates once he displaces that sad nebbish, Bill “Astronaut” Nelson in th empirical capital. Not that anyone here in the reportorial set will follow or report on them. This is nothing new. Throughout the 20th century and probably before, governments have used immigrants to undercut local workers and/or exported their jobs to low wage locales. This is, imo, the real reason for globalization/neo-liberalism and the current backlash against it. New Labour in the UK, the Democrats in the UK and many other so called left/social democratic workers in the rest of the world, have used this to destroy the power of unions, and to lower wages, so that employers and landlords (their true constituency) can make greater profits. These political parties were never on the side of the workers, and that is why these parties now have diminishing or no support. Instead these policies have created a global elite, who don’t care about anyone else. The rise of Trump, UKIP and similar politicians/parties was an inevitable result. Gee, I ‘m old enough to remember when our population was only about 9 million people whereas now it is 25 million. Are we a better country for this population increase? On the whole, I would say yes but now we are moving to the natural limits to what our country can sustain. More so as climate change kicks in. I am not surprised that John Howard’s name figures prominently in introducing these visa changes as he was very much a right wing politician with neocon delusions and his policies still continue on in the people that he left behind like his protege Tony Abbott. John Howard was obsessed with destroying any union power hence his desire to bring in all these extra people. They were supposed to be skilled migrants to fill a local unfulfilled need but when it got to the point that truck drivers from countries like Malaysia were being brought in as none could be found locally, you knew that the game was rigged. The whole point of such programs was to erode wages and conditions in industries over time to give the big bosses and the top end of town the edge over workers. Readers in America will be familiar with this play book. To be blunt, it is a cheap way to fill in the needs of an economy without industry and government having to invest in families, schools, traineeships, apprenticeships and the like. It also robs other countries of sorely needed local talent so is by nature predatory. Such an economy has no depth and has to relies on externalities for its needs making it more fragile when things go bad. These changes are also fueling a bit of xenophobia which is strange when you consider that a third of our population was born overseas. If anything, you see governments encouraging this – John Howard certainly did – which is encouraging our own local demagogues. Luckily they are mostly pathetic. Just my opinion but there it is. Yves has mentioned the Australian “skills-based” immigration system so if any are interested what it is like here is a website which shows it. It is at http://www.visabureau.com/australia/immigration-points-test.aspx and I will say it now that very few of my ancestors would have been able to pass this test. They got in while nobody was guarding the door. I have a short solution. If you don’t want them in “your” country, get the hell out of their countries. I think he means Canadian mining interests should stop devastating rural communities in Latin America and elsewhere if they don’t want to take in economic migrants. And yet Canada isn’t getting a lot of Latin Americans and Australia and the US aren’t getting a lot of Iraqis. We need global north-south justice but immigration won’t line up with geopolitics exactly, it will only come as a side effect. If other Americans are like me, most people in the USA have little to no say about getting into or “out of their countries”. Then the elite will lobby for lower taxes (“starve the beast”) so they don’t need to increase infrastructure/ public services. One should remember the USA’s military is a large employer that probably appreciates downward wage pressure. I do want to get the “hell out of their countries” and have believed this since I watched the Viet Nam war spool up run by the USA’s “Best and Brightest”. My options are rather limited to protesting and voting for one of two pre-selected (by the elite) bad options every four years. One prominent fail of this process is that Trump was not elite pre-selected. We are now watching the body politic’s immune response (from the left and establishment right) to Trump. If you, Wilroncanada, are able to significantly drive Canada’s policies, that is extraordinary. If so, will you share what you do?